/ Recent developments / Fair weather sailors? Not at Desborough. We’re a hardy lot, us sailors, you know – especially when we’ve been denied access to our favourite sport for any length of time. So you know that when the chance to get out on the water eventually does come along, yachties will grab it with both hands – regardless of the conditions at the time. I had to chuckle at this photo sent in to me by Ross Archer, the rear commodore of Desborough Sailing Club in Shepperton. The club had been planning a spring sailing course for some time – and obviously took the view that they were pretty safe scheduling it for early April when you might have expected gentle breezes, warm sunshine and white clouds over a blue sky. 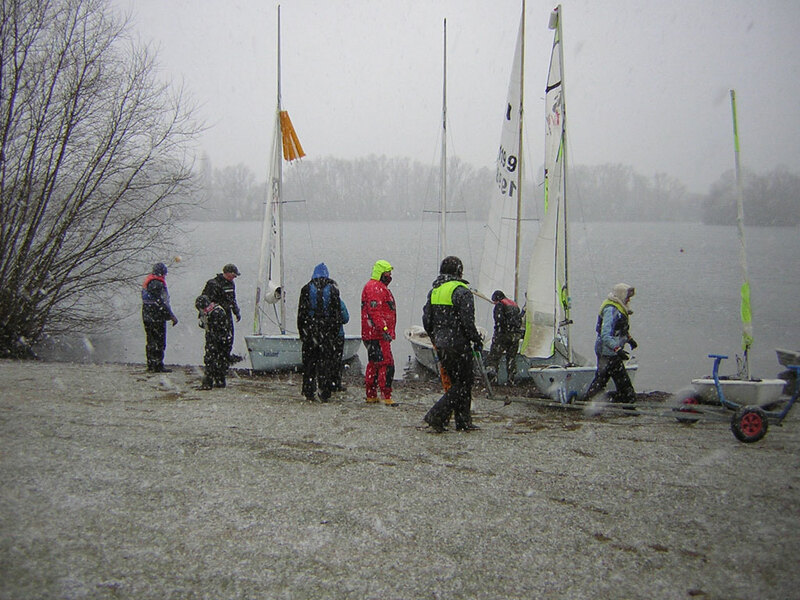 Instead, those who turned up to learn how to sail were greeted with the ground covered in frost, lowering grey clouds and driving snow. I don’t want to hear anyone mention the phrase ‘fair weather sailors’ when talking about the crew at Desborough in future! Well done – I hope you had a great time thawing out in the bar afterwards – and thanks to Ross for sharing the photo. I’VE written a couple of times recently about the excellent job that volunteers working with the Thames21 environmental charity do in cleaning up the banks, towpaths and islands of the river and here’s a reminder that they plan three more litter picks in our area over the next couple of weekends – and they’d be delighted if more volunteers could turn out to lend a hand. On Saturday, April 20, they plan to go back to Desborough Island to give it another spring clean while on the following day, Sunday, April 21, they will be working on the Jubilee River. On Sunday, April 28, the team will be heading to Sunbury Lock Ait . The last time the volunteers worked at Desborough Island, Thames21 organiser Luke Damerum told me they managed to pick up 17 rubbish bags full of litter, one bed, one mattress, one car seat, fishing poles, a suitcase, and some sort of framing for an awning that had been deposited on the banks of the island. It never ceases to amaze me what people dump in the river and we owe Thames21 a debt of gratitude for their efforts to keep this a beautiful place to live, work or walk beside. TALKING of reminders, one of my favourite days of the year is rapidly approaching – the Beaulieu boat jumble – which has become an annual pilgrimage for anyone who loves messing about in boats regardless of whether they have have rags and bits of string (sailing boats) or smoking noiseboxes (cabin cruisers). Regular readers of this column will remember that I was all set to head off to Lord Montagu’s little pad in the New Forest last year about this time when, for the first time in its history, the boat jumble had to be cancelled because of the atrocious weather turning the field into something resembling a swamp. I’m keeping my fingers crossed that we are treated more kindly by the elements this year – and I’ll be doing a full preview of the event in next week’s Riverwatch. FINALLY, thanks to all those readers who have sent me kind wishes about becoming a grandfather – it’s much appreciated.